It’s January… the nights are long, the sky is crisp and dark– so why can’t you see the Milky Way very well, much less get those amazing shots you see online? This tutorial will help teach you everything you need to know about when and where to view our galactic home. Let’s dive in. 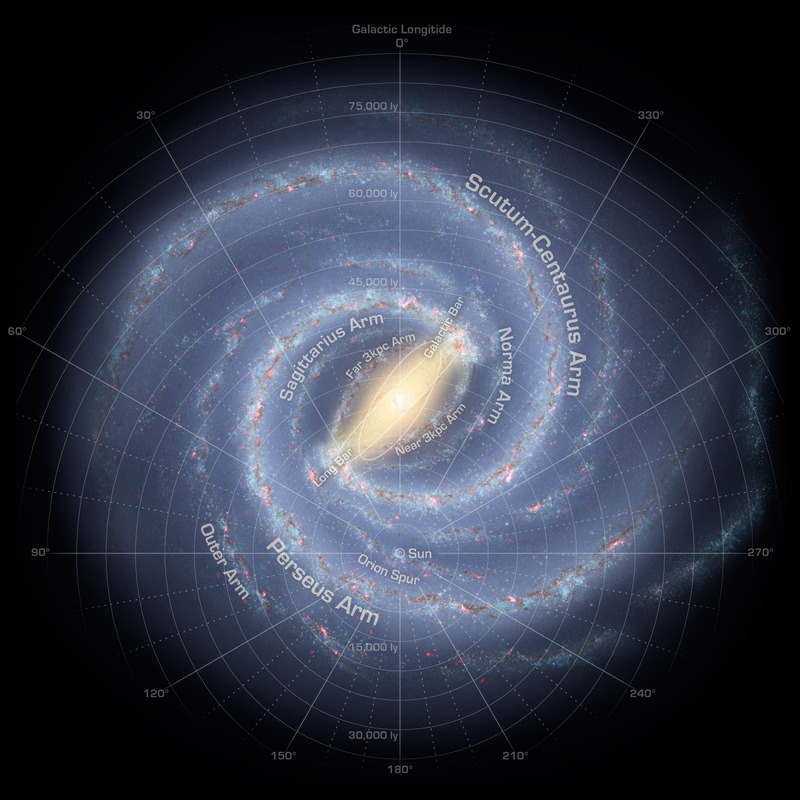 The Milky Way is a disk-shaped structure, centered around a bar-shaped ‘core’ near the center. This is the region you typically see featured in the dramatic astrophotography images that have become popular in recent years, as powerful low-ISO consumer DSLRs have made their way into consumers’ hands. Because of its disk shape, the Milky Way appears as a faint milky-colored band, approximately 30 degrees wide, arching across the sky at just about all times (but visible only at night). Our Solar System is located in one of the outer arms of the Milky Way, as shown below in this NASA illustration (click to enlarge). The plane of our solar system is at an approximately 63 degree angle to the galactic plane. So what does that mean and why is it useful? It means that objects in our Solar System are rotating at almost a perpendicular angle compared to the angle of rotation of all the objects in the Milky Way as a whole (including our Solar System). Practically, this means that the Milky Way will appear at different angles in our night sky depending on both the time of night and time of year. The geometry of the galaxy brings up several important points. 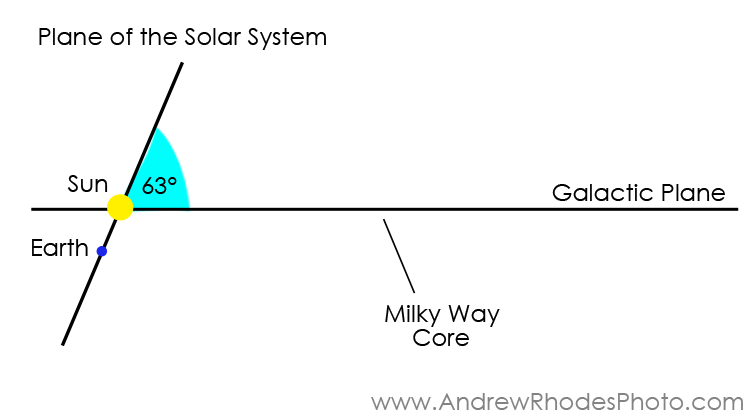 First, since our Solar System is not positioned in the Milky Way core, that means the core only forms a small part of the overall view from Earth. 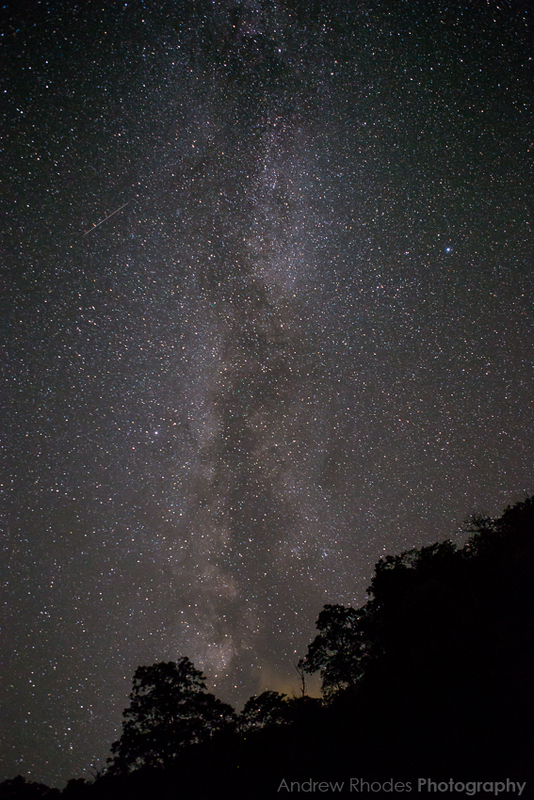 As our gaze moves away from the core (in either direction), the Milky Way begins to fade, since there are fewer visible stars to brighten the band. The second, and perhaps the most important consideration, is Earth’s relative position to the Sun. Since the Earth rotates around the Sun every 365 days, that means that during part of the year, our view of the galactic core is blocked by the Sun. In other words, the core is only above the horizon during daylight hours for a certain part of the year. So when is this? In the Northern Hemisphere, the core is not visible in most of November, December, January, and the first half of February. On the flip side, this means the best time for viewing is from late May to early August. Now that you understand the concepts behind the Earth’s orbit around the Sun and the visibility of the core, it follows that the core is only visible at certain times of night during its visible months. In mid-February, for example, the core becomes visible in the pre-dawn hours just before sunrise, and remains above the horizon during daylight hours. 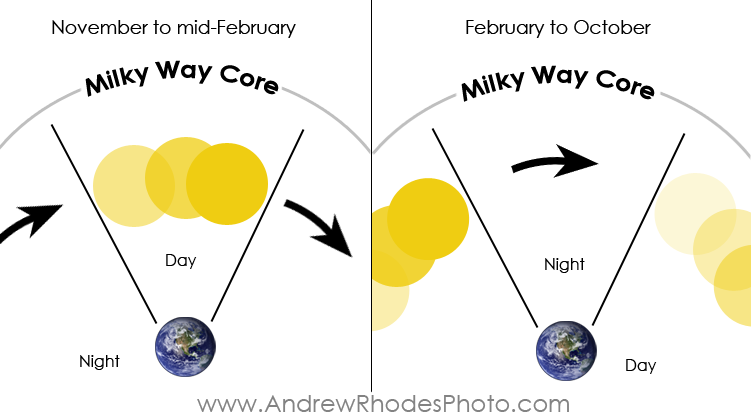 Gradually, the core becomes visible for longer and longer each night, peaking in June & July when it is on the exact opposite side of the Earth as the Sun. During this time of year, the core will be viewable all night, with it being at its highest point in the sky around midnight. From July on, the cycle goes in the opposite direction, as core visibility begins to decrease and optimal viewing time moves towards after dusk, until it disappears from our field of view again in the winter months. The following image depicts the night sky field of view at peak viewing in mid-summer in the Northern Hemisphere. When discussing the visibility of the Milky Way, many people reference the hemisphere, but don’t explain how exactly this factors in. The reason that your location in either the Northern or Southern Hemisphere matters is twofold. First, the duration of daylight is different during the time of year when the Milky Way’s core is most visible. The Southern Hemisphere has the built-in advantage of being in the middle of their winter (i.e. short days, long nights) when the core is most visible. Meanwhile, the Northern Hemisphere is experiencing long days and short nights in its summer months, thereby limiting the available viewing (and photographing) time of the Milky Way’s most visible section. Secondly, your view of the Milky Way is different based on your location as well. The core of the Milky Way is approximately lined up with the constellation Sagittarius, which is situated at a declination of about -30 degrees. This means that both Sagittarius and the Milky Way core are viewable directly overhead to those living at a latitude of -30 degrees. For those of us in North America or Europe, at latitudes between 25 and 50 degrees, this means we will always see the galactic core rising up from the horizon in our southern sky. Now this isn’t all bad news for Northern shooters, since this allows for the easier incorporation of the landscape into our shots, but it does offer some awesome views the further south you travel. 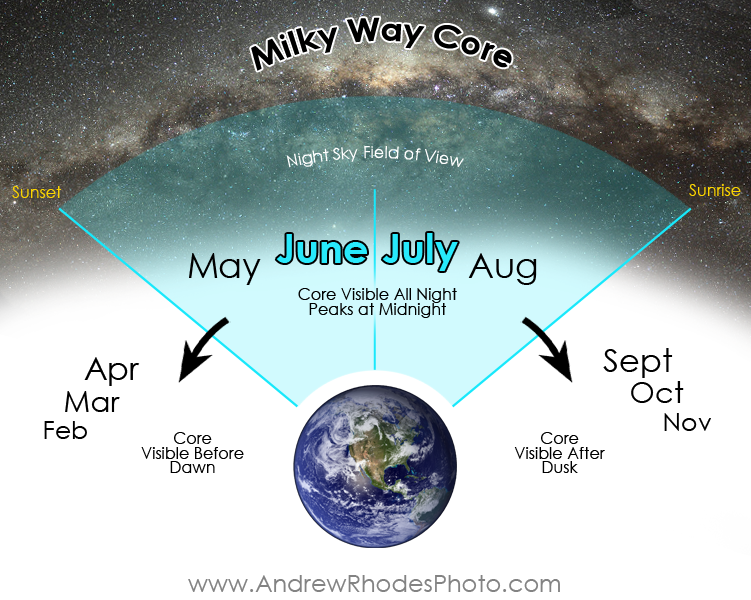 Don’t forget that in the winter months you can still see the Milky Way, just not the core. You can use Orion and Gemini as reference points during these months (The Milky Way goes right between them), as well as Cassiopeia (all year), which cuts right across the faint milky arc at almost due North. I highly recommend downloading both the Google Sky Map app to your phone for on the go reference, as well as downloading the incredible Stellarium program (free) to your laptop or desktop. The latter allows you to preview the night sky at any given point in time, and is an essential utility when preparing for an astrophotogrpahy expedition. As if there weren’t enough factors to consider already, the phase of the moon and the weather are the final two pieces of the puzzle. I can’t tell you how many times I’ve had a free weekend in June, only to be cursed with a full moon or overcast sky. Keep a moon phase calendar handy in your bookmarks or on your calendar, and know when the moon rises and sets each day. You can usually find this information wherever you get your weather online. It goes without saying that you want an almost completely clear sky for optimal star shooting, so keep an eye on the forecast during the days when the moon is not a factor and base your shooting around that. 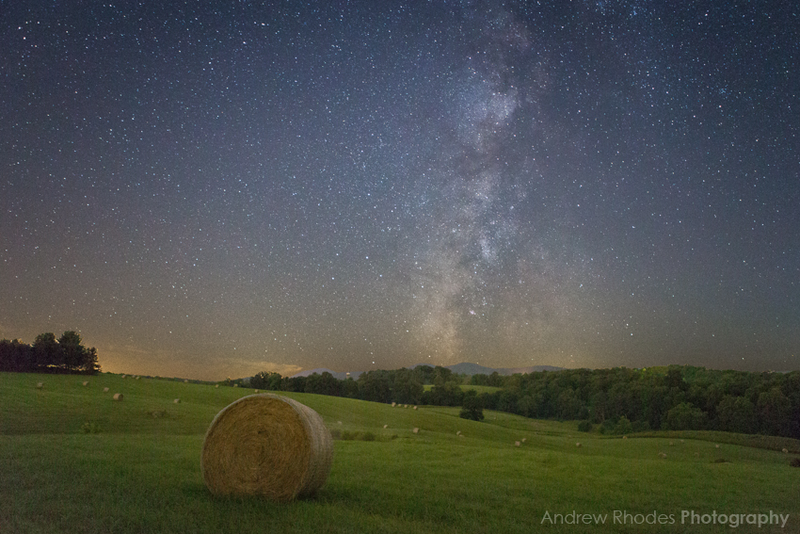 Finally, if you’re new to astrophotography, learn where to find dark skies. A handful of resources are available, but I prefer to use Jonathan Tomshine’s Dark Sky Finder website. As you become a more experienced astrophotographer, you will find some favorite spots and learn some tricks to block out light pollution (i.e. shooting towards mountains or the ocean) as you go. As to the equipment you need and settings to use? That’s an entirely different discussion, and plenty of information exists online to assist. As some general advice, I shoot with a Canon 6D that I can’t recommend enough, along with two f/2.8 L lenses (the 16-35 and 24-70). A rock solid tripod is also a must (I use a Gitzo 2540 with a Really Right Stuff BH-55 ballhead). Your exposure length should never exceed 30 seconds if you want sharp stars (15-20 sec is ideal), shoot wide open at f/2.8, and play with a variety of ISOs to get your ideal exposure (I’ve gone up to ISO 6400 using my 6D with great results).